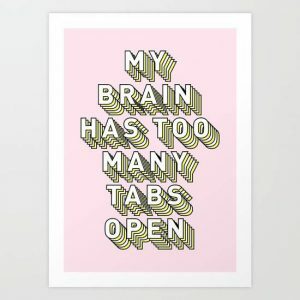 It’s been so long since I wrote a proper blog post. 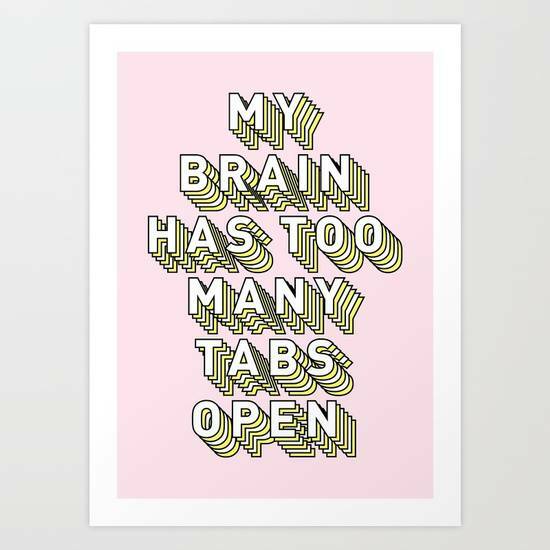 Things always seem so hectic. As usual, I have just about recovered from Christmas and New Year, when Emily and Rob’s birthdays arrive and this year they were quickly followed by half term. Add into the mix a leaking radiator, a new washing machine, a new Motability car, Emily’s high school offer, Emily’s build up to SATS and bad weather (with extra days off school for Emily, no PA and Rob working at home) and that’s me exhausted just thinking about it!! The emotions of Christmas and New Year and birthdays are as hard to deal with as the physical and I am into my 21st year of ME. I think I will leave those things for another post. 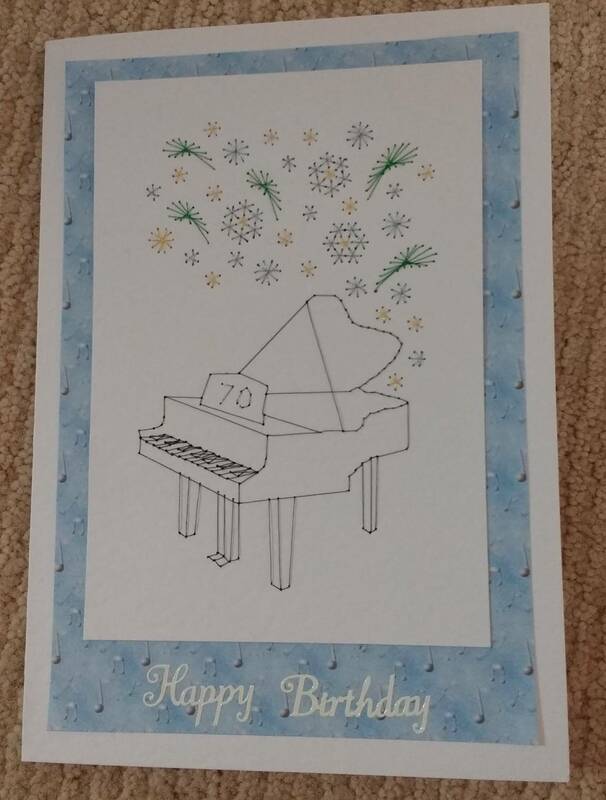 Of course birthdays require cards and presents so I have been making a few behind the scenes, though I seem to spend hours planning them even if they are only simple so each card seems to take days. Then I have to remember to photograph them and save them to my PC. 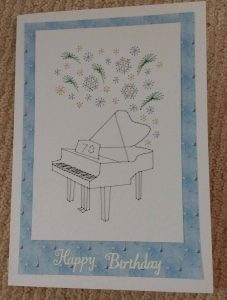 I always seem to forget one stage or another and have been known to post the cards without signing them!! So what have I made, bear with me whilst I locate the images which seem to have a mind of their own and turn up in the wrong folders! I never know should that sentence have a question mark in it? 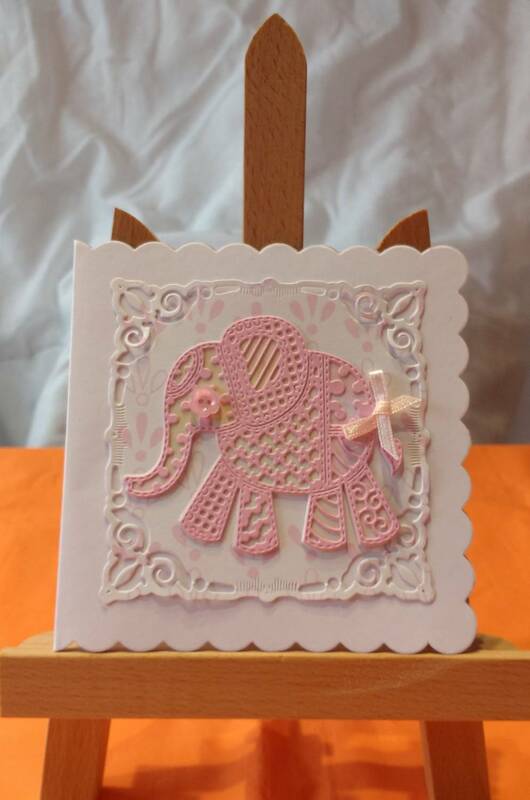 Small card made with Tattered Lace Patchwork Elephant Die and Spellbinders Adorning Squares Die, mounted on scalloped card. 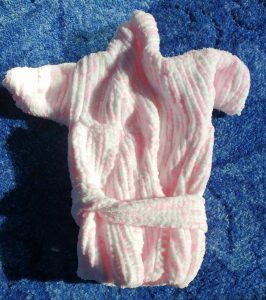 This item is available in my shop. Made with Lady with Umbrella Die cut in sparkly card. White oval die from stash and Forever Friends backing paper sample. 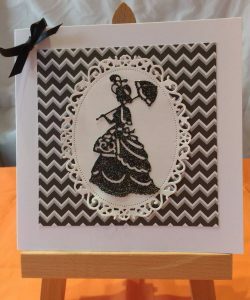 After making this I have a desire to make more of these black and white cards as I think they are simple, but effective, so watch this space! 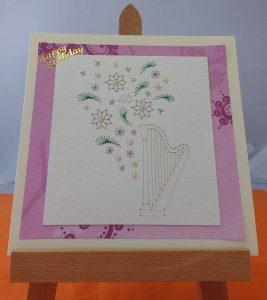 This card is available in my shop. 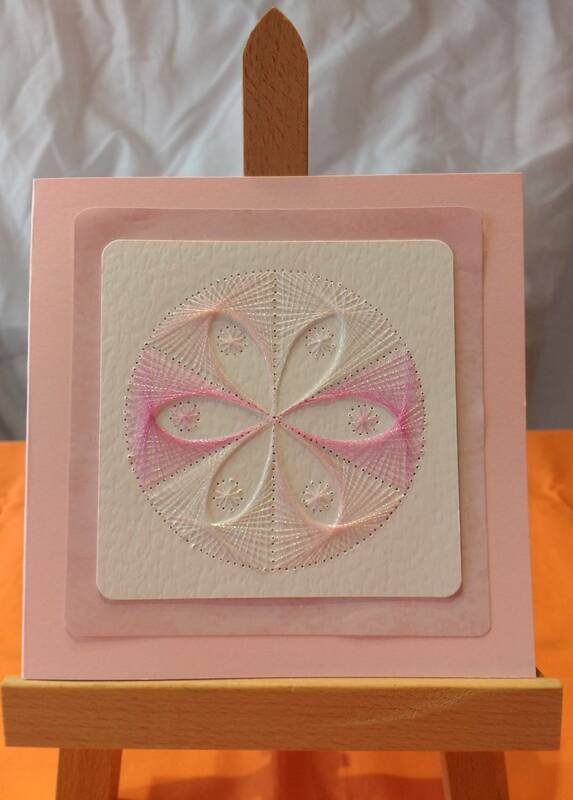 Made from Stitching cards pattern, stitched with metallic thread in shades of pink and white. 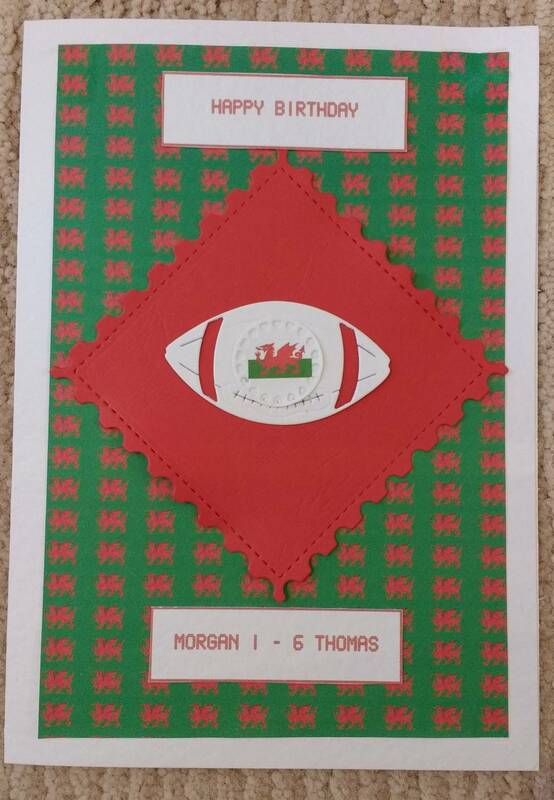 It took a while to make this card. I managed 5 segments without too much trouble, but final segment took about 6 attempts to get it right! All the segments are the same!! 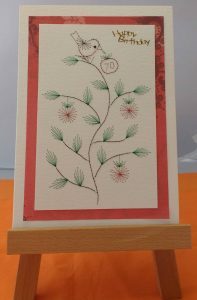 This card is available in my shop. Made with Cottage Cutz Cat Garden Die cut in sparkly card. 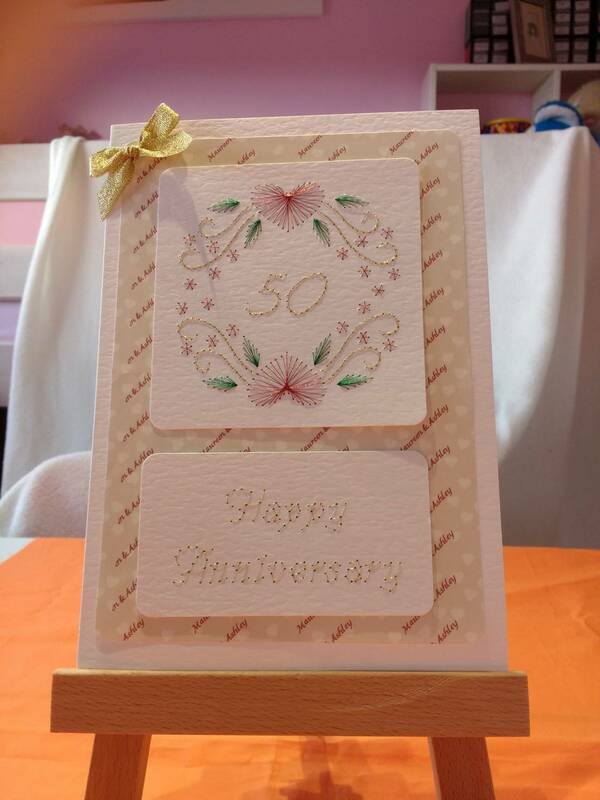 Mounted on Spellbinders Adorning Squares Die and Forever Friends backing paper. Made for a friend who likes cats and who feeds my cat when we are away. 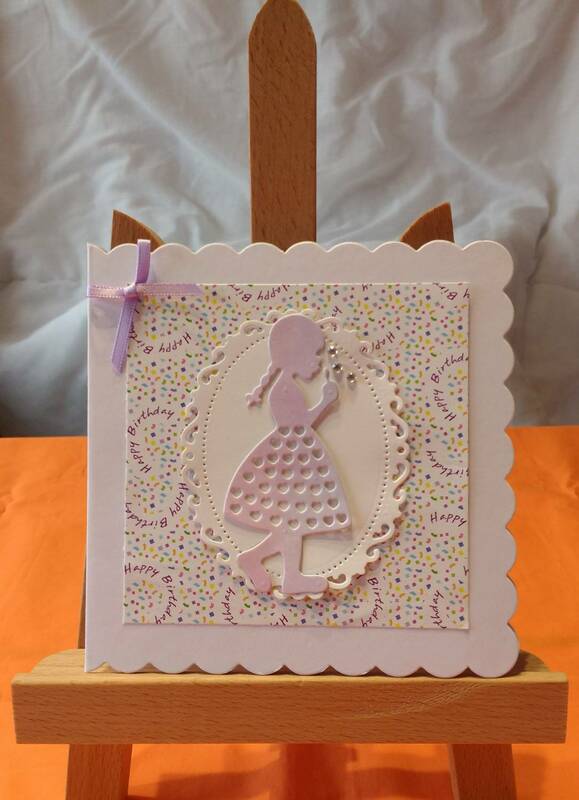 Small card made with Girl Blowing Bubbles die, mounted on Spellbinders Ovals Die, backing paper from stash and card from Craftstyle. 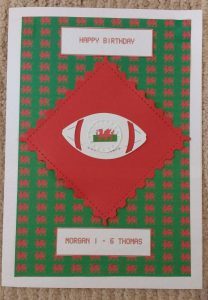 This card was made for my husband, using pattern from Stitching cards and stitched with metallic thread in shades of green. 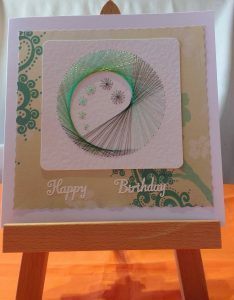 Backing paper from Paperprintables. My husband tells me that the shape has a name, I thought it was a circle and he couldn’t remember what the name was. I found this confusing to stitch and there is a mistake in the colour change, but I don’t think it is noticeable. 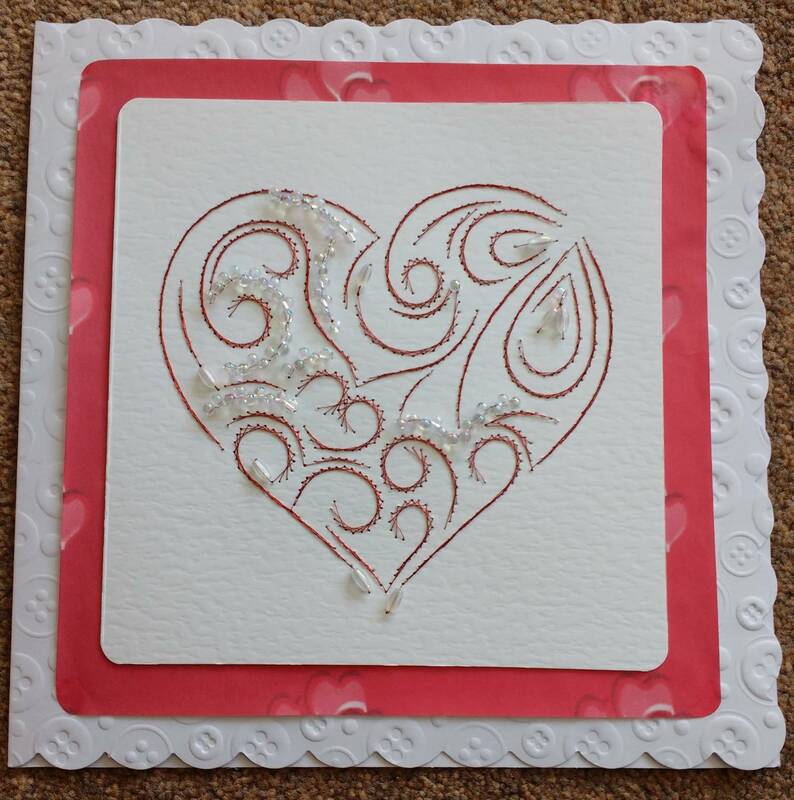 Made for Valentine’s Day using pattern from Craftsuprint and backing paper from Craftville. 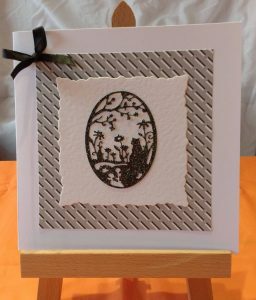 Mounted on button embossed card from Craftstyle. I wanted the beads to match in colour, but didn’t have correct sizes so the rice beads are a little small and the seed beads a bit big so the finished effect is not as delicate as it should be, but pretty all the same. 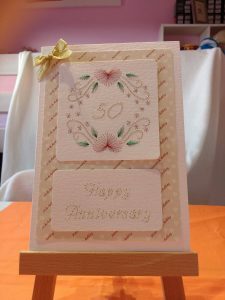 Made for 70th birthday using pattern from Stitching Cards, Rob used a bird from another pattern and added it with the apple so it could be personalised. Backing paper from Paperprintables Apple Blossom. stitched using metallic thread. 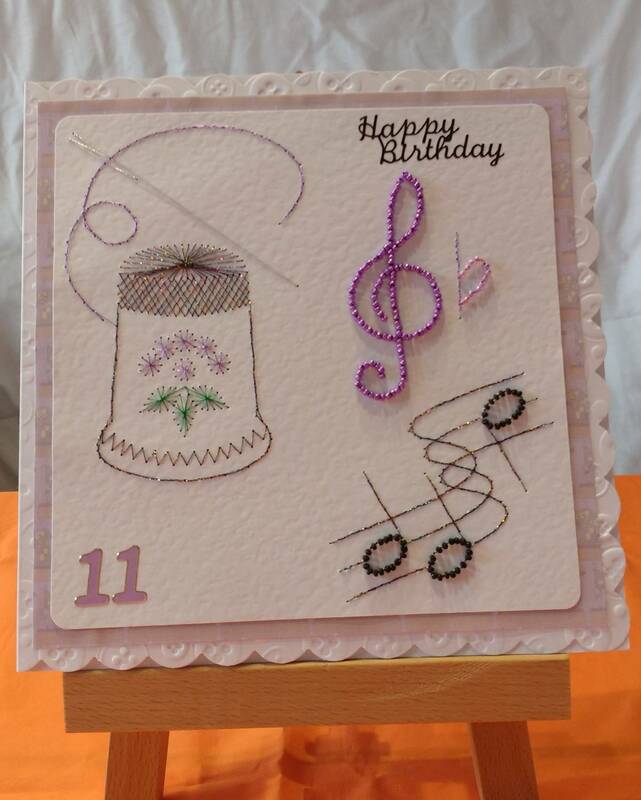 Next a 40th birthday with pattern from Stitching Cards, 40 added in place of one of the stars. 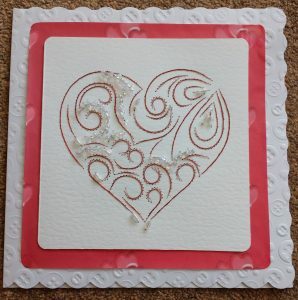 Backing paper again Paperprintables Apple Blossom. Stitched in metallic thread. Another 70th birthday and another music pattern from Stitching Cards, 70 added. 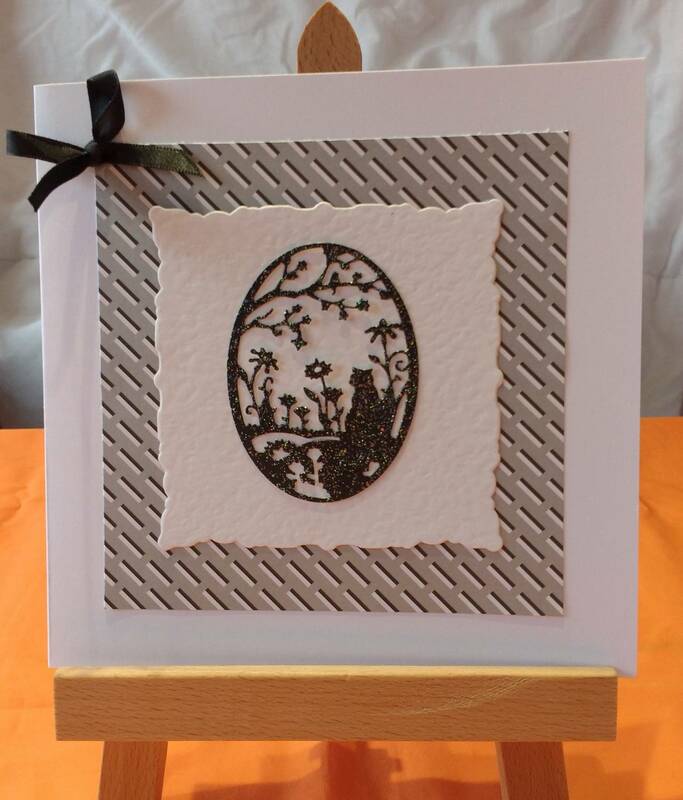 Backing paper from Craftville. stitched with metallic thread. 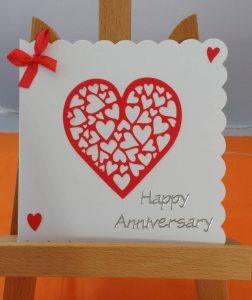 Anniversary card made with Sue Wilson Heart of Hearts Die cut in red sparkly card and mounted on small Craftstyle card. 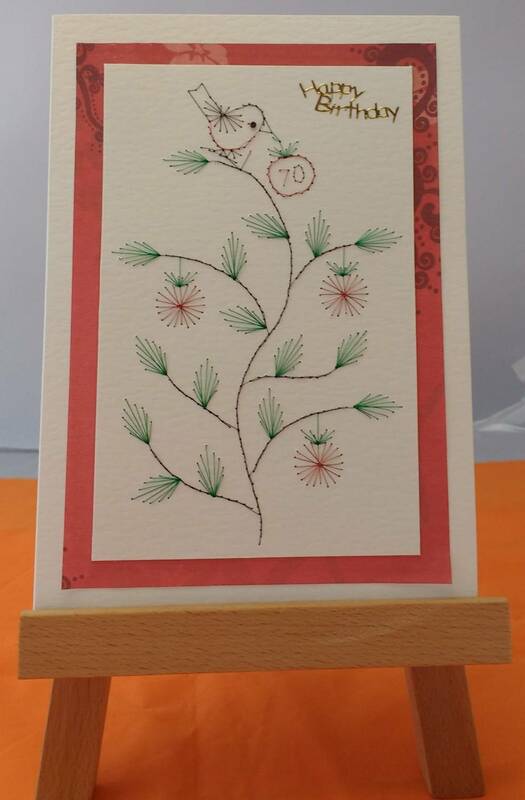 I actually added some red gems to the card after the photograph. This butterfly card made for Mother’s Day using Tattered lace Build a Butterfly Die and Demi Awaking Squares die. 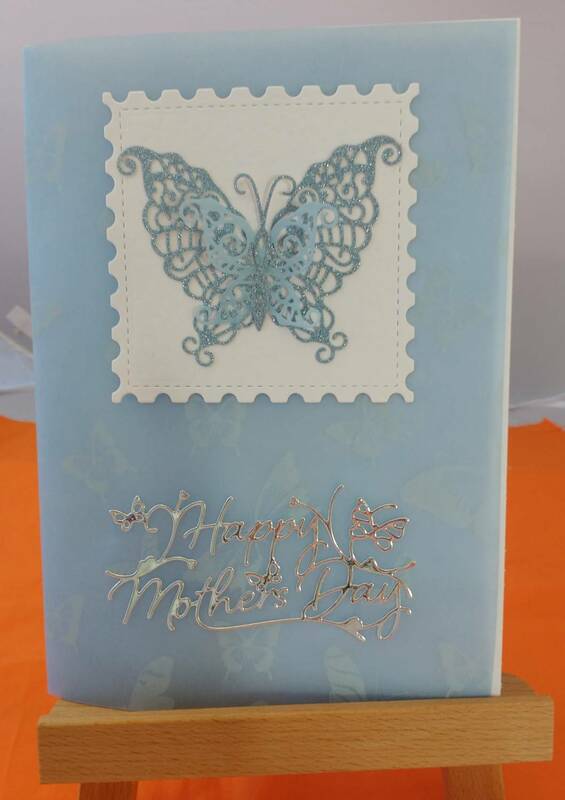 The card is covered in blue butterfly vellum and mothers day die cut added. The wording was bought ready cut rather than purchasing the die. 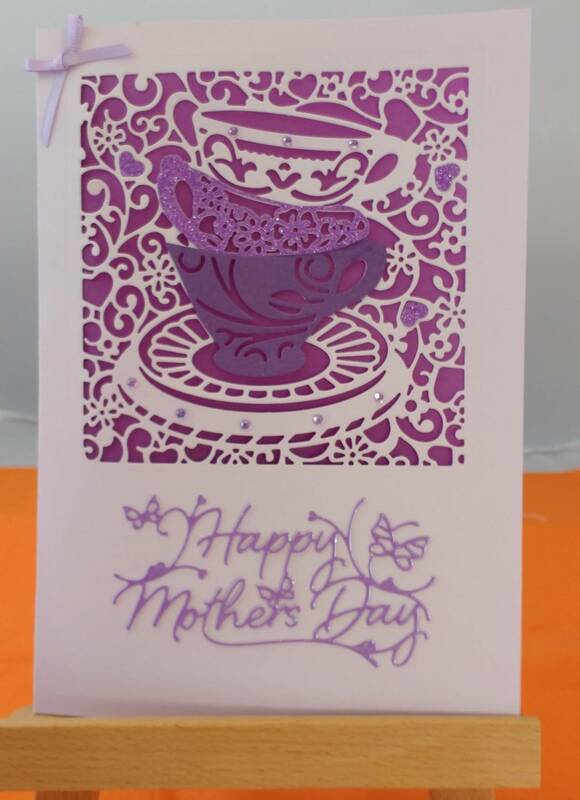 This Mother’s day card created with Die’sire Tea Party Die cut into lilac card and then cups cut again in shades of purple and added to card, with sparkly gems on saucer and top cup. 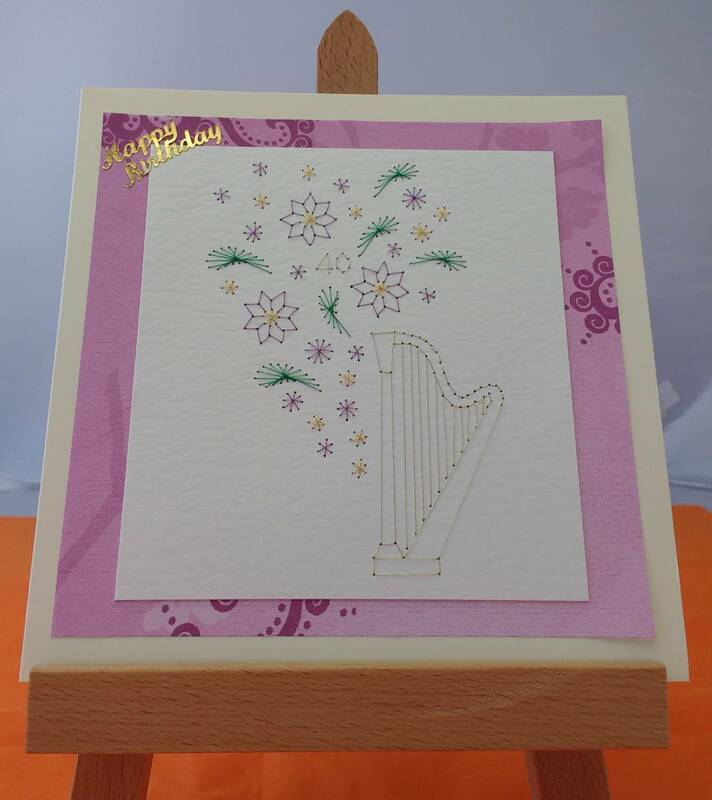 Mothers day wording added using ready cut wording. 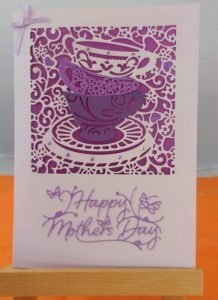 Card is lined with purple vellum to show through pattern. Wow finally got to the end. I have included a lot of details and it has taken several days to complete this post. The links I have used are not where I have purchased many of the products from, but are just to show what the product is. 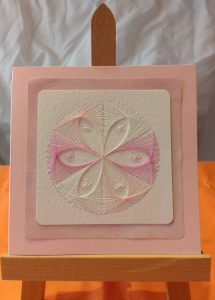 I only buy cutting dies when they are on special offers or I ask for them as gifts. It was supposed to be a Christmas present, then a birthday present, I finally finished it last week! Now got matching slippers to make, 1 down 1 to go! The wool is James C Brett Flutterby Chunky and is the softest wool I have ever felt. The pattern is Sleep Tight Tilly’s Wishes.